Ms Demsky is a prolific painter with an exploratory spirit who moves confidently between styles & techniques. Many of her recent Mylar paintings, for example, are three-dimensional. Ms Demsky is inspired by nature, particularly the ocean and forests, and by the cosmos. She favors shimmery blues and contrasting bright colors. “I feel energized by the movement, reflections and color of water. I hear music in the rustling of the trees.” Ms Demsky has received many national awards, including The Fulbright Fellowship to the Netherlands, The National Endowment for the Arts Fellowship to Italy, the Christa McAuliffe Fellowship in NY. She was awarded the Andy Warhol Residency, Acadia National Park Residency, The Ragdale Foundation Residency and the Virginia Center for the Creative Arts Residency. 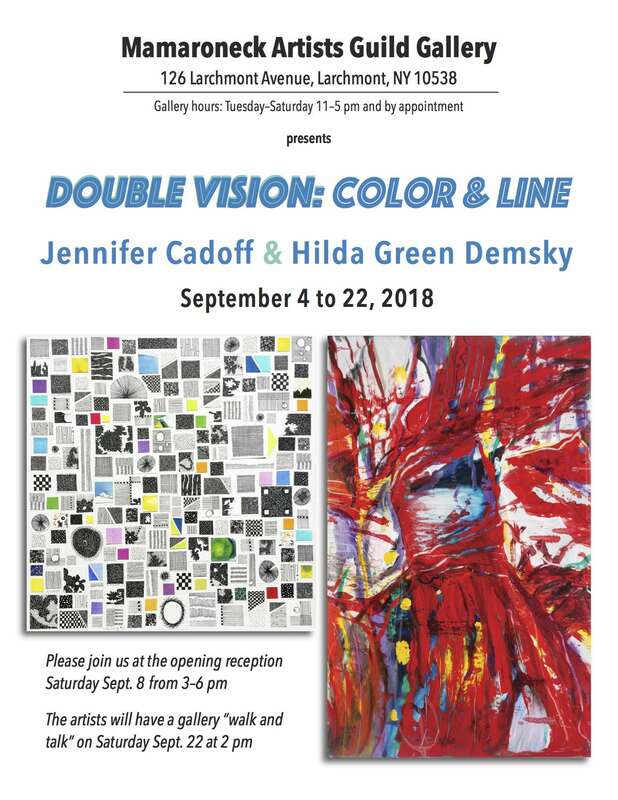 This past July she was painting new work for this show at a summer residency at the Golden Apple Residency in Maine. Ms Demsky lives in Larchmont & paints in her studio in Port Chester. For the last several years, Ms Cadoff has worked almost exclusively on paper, using ink, watercolor and sometimes thread and other materials to explore the tension between energy and entropy, control and disarray. Her drawings rely on a personal language of marks that include scribble, hatch marks, tiny circles, grids and dots. Her work has been included in Art of The Northeast (AoNE) at Silvermine Arts in New Canaan, CT; the Non-Member Graphics/Photography show at Salmagundi in New York City; “America Through Artists’ Eyes” at the State Museum in Trenton, New Jersey; and “Jersey Women Artists Now” at Montclair State College. A long-time New Jersey resident, Ms Cadoff is excited to be making connections – and finding new inspirations for her work – in New Rochelle, where she now lives, and in the broader Westchester community.